Malawi’s Electoral Commission has officially launched campaigning for May elections with calls against political violence. Political violence is on the rise in Malawi as the country prepares for May elections. The victims are mostly opposition party members beaten by suspected supporters of the ruling Democratic Progressive Party. Campaigning will run until May 19, just two days before Malawians cast their votes for lawmakers in the National Assembly and for the president. Voters will also cast ballots for local government representatives or councilors. The run-up to elections has been marred by concerns about political violence. A number of opposition party members were beaten by suspected supporters of the ruling Democratic Progressive Party. DPP officials deny the allegation. But tensions were on display Tuesday at the ceremony marking the launch of campaigning. The ceremony was disrupted for nearly half an hour when supporters of the main opposition Malawi Congress Party and the ruling DPP shouted insults at each other. Malawi Electoral Commission Chairperson Jane Ansah issued warnings to the parties. Ansah said political violence has been soiling Malawi’s electoral process ahead of the May elections. Authorities have warned they will disqualify presidential candidates whose supporters engage in violence during the campaign period. Malawi’s Electoral Commission has forced presidential candidates to sign a code of conduct during campaigns. Political parties have pledged their commitment towards peaceful campaigns. Ansah said that the Commission will be monitoring campaign activities to ensure political parties have complied. “The Commission strongly warns all supporters never to engage in any acts of behavior that is likely to cause incitement to public disorder, rebellion, hate or violence. This is not in tandem with peaceful conduct of campaign process,” she said. 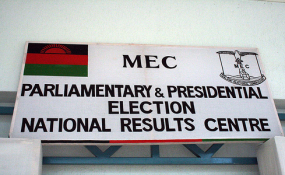 The MEC says about seven million of Malawi’s 17 million people have registered to vote. The United Nations says if not addressed, Malawi’s rising political violence could discourage people from voting. "We are expecting the political parties to really take serious the rule of the game, meaning the frameworks which MEC has put together with a code of conduct and political party laws. And the conduct of the campaign will be a fantastic prelude to a peaceful voting on the 21st of May,” said Maria Jose Torres, the country coordinator for the United Nations Development Program. Former Malawian president Joyce Banda earlier this month withdrew from the election to support the main opposition candidate, Lazarus Chakwera. Banda became the country's first female president in 2012, after then-president Bingu wa Mutharika died of a cardiac arrest. But her term was marred by a corruption scandal known as Cashgate in which over $32 million was siphoned out of government coffers. Banda lost the 2014 election to the late president's brother, current President Peter Mutharika.